* In Kyoto City and Prefecture, after April 1, 2018 it will be obligatory to enroll in Bicycle Insurance. ・Riding while using mobile phones or using headphones/earphones is strictly prohibited (those who violate this law are subject to punishment). ・As a rule, cyclists must use left side of the road. 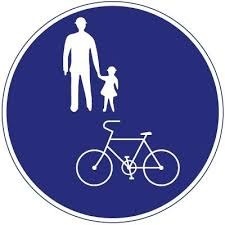 Some streets have the designated paths for cyclers on the left side. Signs will indicate if riding on sidewalks is permitted or not, please pay careful attention. When you use such sidewalks, you must ride slowly and on the side closest to the road. You must be careful not to disturb pedestrians, and if necessary, you must temporarily stop riding in order to let pedestrians proceed (those who violate this law are subject to punishment). ・You must not ride but walk your bicycle on crowded sidewalks and in designated areas. ・When you intend to turn right at the crossing with no traffic lights, you must use the far left side of the street, first cross to the other side, and then turn right slowly after confirming the flow of traffic (Those who violate this law are subject to punishment). ・Don’t turn to right in the same way the automobiles do at intersections. ・You must switch on your headlight when riding at night (those who violate this law are subject to punishment). ・Both riding a bicycle under the influence of alcohol, as well as riding with two people to one bicycle is prohibited (Those who violate this law are subject to punishment). Do not leave your bicycle on streets or sidewalks where it might block or disturb pedestrians. Please park your bicycle in designated areas. You can search for bicycle parking on the Kyoto City Cycle Website. 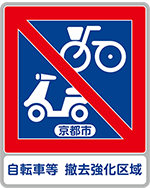 * Kyoto City Ordinances prohibit the parking of bicycles on the street, especially in front of stations or other congested areas. The city will confiscate bicycles parked in any area of Kyoto City marked with a no parking sign (See right). * Confiscated bicycles will be kept at the bicycle impound lot for four weeks. * If you do not retrieve your bicycle within four weeks, it will be disposed of. * If your bike is missing, first check to see if there are any signs nearby or notifications placed on the pavement. These will indicate which impound lot your bicycle was taken to. Look for a signboard or poster near the spot where you left your bicycle to find out which impound lot your bicycle was taken to. To retrieve your bicycle, you need your bicycle key, a form of identification, and money for the handling charge of 2,300 yen. You must enroll in bicycle insurance to provide a means to provide financial coverage for injuries to yourself and others, etc. in the case of an accident. * Bicycle Registration (Bohan Toroku) can be used to easily identify the owner of a stolen bicycle. Registration is compulsory by the law. * When you buy a bicycle, register your ownership at the bicycle shop. It is valid for ten years and costs 510 yen. If you receive a used bicycle that someone else has registered, you must change the registration. * When leaving your bicycle, remember to always lock it. * Cars and motorbikes must run on the left side the road. You must fasten your seatbelt while driving in a car and wear a helmet when riding on a motorbike. * Children under six years old must use a child seat in the car. * The law prohibits driving a motor vehicle while talking or texting on mobile devices, as well as driving under the influence of alcohol (Those who violate this law are subject to punishment). * The law requires privately owned cars to be inspected once every one to three years. Car owners must have an accident insurance policy as a protective measure against accidents (fixed amount applies). If you obtained the international driver’s license before coming to Japan, you are able to use this within Japan without further action. However, this license is valid only for one year, regardless of the expiration date described on your license. * However, the international driver’s licenses from countries that have not signed the “Convention on Road Traffic” (Geneva Convention) are not valid. * If you have registered as a resident/foreign resident of Japan, you cannot use an International Driver’s License unless you stayed in the country you obtained your license for more than 3 months. * In order to drive a scooter, you need “A” in the section of “the vehicle(s) you are able to drive” on the international driver’s license. If you brought your national driver’s license to Japan, you may convert your country’s license to a Japanese license at the driver’s license examination center or Unten Menkyo Shikenjo. ① Your driver’s license must be valid (Your license has not expired). ② A document to prove that you have stayed more than three months in the country you obtained the driver’s license. * The validity date of Japanese driver’s license is written on the license card. * Renewal of your license must be completed one month before or one month after your birthday. Submit your driver’s license and a renewal fee of 3,000- 3,850 yen. (The fee varies according to your record of violations). * In order to pass the test, you must study the Japanese traffic rules and regulations. * In Japan, driver’s licenses for automobiles are issued to those who are 18 years old and above. Driver’s licenses for motorcycle are issued to those who are 16 years old and above (For motorcycles 400cc and above you must be 18 or older). If you are younger than the above ages, a driver’s license will not be issued. * If you would like to take the knowledge test in English, Chinese, or Tagalog, please ask the person in charge. * For further detail, visit the website of Kyoto Prefectural Police Website. JR limited express “Haruka” JR Kyoto Station 75 min. The subway system is managed by Kyoto City. There are two lines on the city subway, Karasuma Line & Tozai Line. The Karasuma Line runs north and south between Takeda Station and Kokusaikaikan Station, and the Tozai Line runs east and west between Rokujizo Station to Uzumasa Tenjingawa Station. The fare varies between 210yen and 350yen depending on your travel distance. The subway system connects with some private railway lines. If you travel beyond a station your ticket covers, you must pay the adjustment amount to your fare at the fare adjustment machine or pay station staff. Smoking is prohibited on the train and in stations. JR is the largest railway company in Japan, and covers the whole country. For limited express service, Green Car, sleeping car or Shinkansen you must pay extra fees. Smoking is prohibited except for designated smoking rooms or cars. If you are adverse to cigarette smoke be sure to make a reservation for a non-smoking car. Kintetsu Kyoto Station is located in the south part of JR Kyoto Station premises. City bus service is available throughout Kyoto. City buses allow access to most of the sightseeing spots in Kyoto (the color of the body of city buses is green). Use the rear door to enter the bus. Press the nearest button to inform the driver that you will get off at the next stop. Exit at the front of the bus, and put the exact fare or a ticket into the fare box located next to the driver. When you use an IC card, touch on the card reader near the fare box with your card at the start and end of your journey or for some buses just when you exit, and for other types of card, put your card through the card reader when you get off. * Within the flat fare zone, a flat fare of 230 yen is charged. * Outside of the flat fare zone, bus fares vary according to the distance. In these areas, take a numbered ticket from the machine at the rear door when you get on the bus. Find your fare on the fare table located above the front windshield of the bus and then put the exact fare and the distance number ticket into the fare box. When you use an IC card, touch on the card reader near the fare box with your card at the start and the end of your journey. * Bus fare for children from 6 years old to 11 years old is half of the adult fare. The fare for children under 6 years old who are accompanied by an adult (father, mother, guardian etc.) is free of charge. * If you do not have change, it can be obtained by using the changing machine at front of the bus beside the driver. * City bus service is operated until about 10:00 p.m.; times for the last bus are displayed with red lights on the signboard. * English, Chinese, and Korean Bus Maps are available at City Bus Information Centers and the International Community House. Some discount tickets are available for trains and buses. For further information, ask the Kyoto City Transportation Bureau and other train companies. Coupon tickets (kaisuken) Book of tickets for use within a fixed area, each ticket is cheaper than the normal price. Commuter pass (teikiken) Unlimited use within a fixed period and along a fixed route. Student discount pass and tickets (gakusei waribiki) You can buy a student discount pass by submitting a student discount certificate issued from your school. When you travel a distance of more than 100 km by JR, you can also use a student discount service by submitting the student discount certificate. Traffica Kyo card This card is accepted by at all City Subway Stations and on all City Busses. It is sold in subway ticket vending machines and at bus ticket offices. Insert this card directly into subway ticket gates. Instead of purchasing train or bus tickets, you can use IC cards, such as ICOCA and PiTaPa for travel on most railway and bus companies nationwide. Taxies have three sizes: small, medium and large. The fares vary according on the size of the taxi. The name of the taxi company is displayed on the lamp on the roof of the taxi. In Japan, opening and closing of the rear doors of taxies are mechanically operated by the driver. ◆ How to catch a taxi. * Raise your hand to indicate to passing taxis you would like a ride. Taxis have a display lamp indicating occupancy; an empty cab will stop for you. * It is easier to catch a taxi at a taxi stand near stations and on main streets. * You can call a taxi company to request a taxi be sent directly to your location. * The fare is indicated on the meter located on the panel to the lower left of the driver. Check when you get into a taxi. * Night fares, between 11:00pm and 5:00am, are higher than the normal fare, due to a late-night surcharge. However, the fare system varies from company to company.